I am a volunteer art teacher, grades 1 through 6, at a Catholic elementary school. I love kids and glitter—hence the name of the website. In the first grade, we seem to do a lot of projects that include glitter or glitter glue. Mrs. Miller, the 1st grade teacher, has taken to calling me the Glitter Queen. I swear some of the glitter used at the beginning of the school year can still be vacuumed up in May. But, we’re happy glitterers! 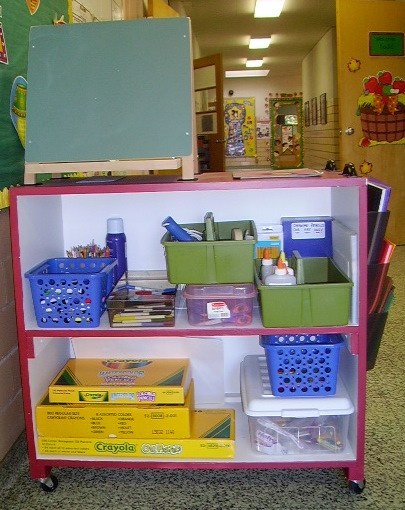 As in many schools, we’re limited when it comes to the supplies available. We have to change projects to use the supplies we have. The challenge that this affords is sometimes what makes a project personal and unique. We also like to recycle. My favorite recyclables are wire coat hangers, newspapers, wallpaper sample books, baby food jars, old maps, used greeting cards, brown paper sacks, etc., etc. You name it and we’ll try to find a use for it. I am very interested in new ways to use puzzle pieces. I’ve seen the picture frames and ghost pins, but there have to be more uses than that. Getting back to the projects on this site, whenever possible I include patterns to keep the completion time within the one hour time limit. These patterns are just an option. If I know that the project will take two or three art sessions to complete, I make a note of that with the project. Feel free to use any of the projects for your own use or if you are a home schooling mom, a student teacher, a classroom teacher or an art teacher. If you use one of my projects on your blog or website, I ask you to reference my blog in your post. I would love to see how you use or interpret the project. Please do not “cut and paste” pages from my site to yours. 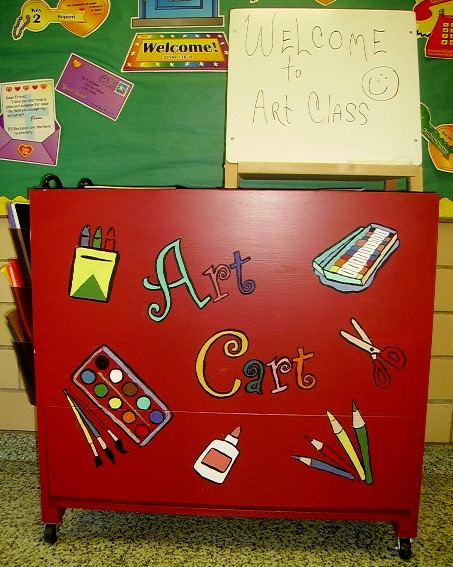 The school’s maintenance man, who really is a “Jack of all trades,” was kind enough to make us a cart to carry our art supplies to the classrooms. I’m so proud of him and the cart that I’m including pictures of the cart. I’m sorry you are having trouble getting to the Dancing Hearts project. 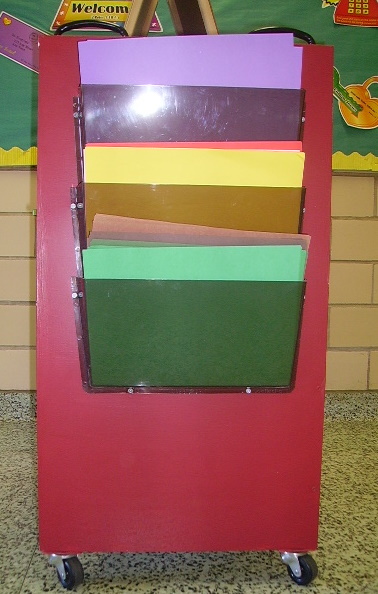 The project is in the 1st Grade Projects Gallery in the sidebar. You can highlight the URL below, copy and paste it. I hope that helps. If not, please send me an e-mail at loraine.brummer@gmail.com and I’ll send the project to you. I really like some of your projects especially the dancing heart flowers. I am having trouble getting to the instructions on how to make these flowers. Could you please help me get to the instructions? I’ve fixed the problem with the Stuffed and Sittin project. You can go to the Thanksgiving Gallery and click on the project there. I’m sorry if this has caused you any inconvenience. Thanks so much for drawing my attention to the problem. really gеt helpful data regardіng my study and knоwledge. Thank you, Judy, for your kind words. I hope you return often—it’s why I’ve been putting the projects on the site. I know teachers are very busy and if I can help, even a little, I feel my time has been well spent. Your comment means so much to me—you’ve made my day! I just happened to see your site when looking for Nearika’s to show the students on screen tomorrow. I teach Art at a K-8 charter school and also collect many things to make projects. I think you have some really wonderful projects and will try the Helping Hands soon and let you know how it goes. Your Art Cart is adorable! I liked your lenten foil ideas. I used foil for Mexican Tin Ornaments. We used cardboard and glue with various shapes and students used sharpies to color. They turned out well. I don’t have a web site, and probably won’t, but I greatly admire what you are doing. Yes, I do love glitter, too! I was excited to see your ideas. I teach Reading and Language Arts at Wayne State College, but I also do some After-School Art classes at the Norfolk Arts Center. I am constantly looking for new ideas. It is great to see a sight from close by with tried and true ideas. Thank you for sharing. About using glitter – my story, I can use it for any outdoor projects but inside the Arts Center, it’s rather iffy – we “glittered” the whole center one summer! But I did get a nifty idea for using glitter. Use nail polish instead of glue, it is less thick, dries fairly quickly and has a built in brush! It was fantastic when we used it on rocks.